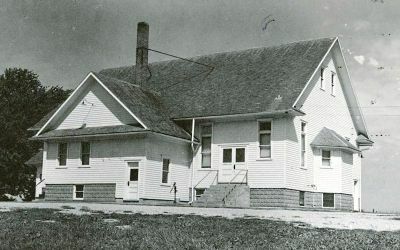 Fairview Mennonite Church in Kalona, Iowa in 1947. Source: Mennonite Community Photograph Collection, The Congregation (HM4-134 Box 1 photo 011.1-1). The Fairview Mennonite Church (formerly Fairview Conservative Amish Mennonite) was originally a part of the Upper Deer Creek-Fairview congregation, located four miles (6.5 km) north and two miles (3.3 km) east of Kalona, Iowa. To serve members living in this area a meetinghouse 42 x 60 ft. was built in 1936. Ministers who served this congregation included Elmer G. Swartzendruber, bishop; Albert S. Miller, Jacob J. Miller, and Morris Swartzendruber, ministers; and Noah S. Miller, deacon. The 1954 membership of the congregation was 470. In 2008 the membership was 179; the pastor was John Hershberger. See also Upper Deer Creek. Swartzendruber, Elmer G. "Fairview Mennonite Church (Kalona, Iowa, USA)." Global Anabaptist Mennonite Encyclopedia Online. 2008. Web. 25 Apr 2019. http://gameo.org/index.php?title=Fairview_Mennonite_Church_(Kalona,_Iowa,_USA)&oldid=140663. Swartzendruber, Elmer G. (2008). Fairview Mennonite Church (Kalona, Iowa, USA). Global Anabaptist Mennonite Encyclopedia Online. Retrieved 25 April 2019, from http://gameo.org/index.php?title=Fairview_Mennonite_Church_(Kalona,_Iowa,_USA)&oldid=140663.